I am doing two evening shows and some education outreach events at the Kravis center in West Palm Beach! NY area! i have a show in East Hampton June 24th at the beautiful Guild Hall! please spread the word. I am back at McCallum theater in Palm Desert on June 14th! Pass not available online. Please call the box office at (760) 340-2787. Shows recommended from age 7 and up. May 31st in LA, free! I am at the University of Maine in early April. The Intermedia MFA Tuesdays at the IMRC Lecture Series continues to provide the UMaine, Orono and Bangor community with a diverse schedule of compelling speakers, and performances by contemporary and interdisciplinary artists and performers from around the country and world. All events are free, open to the public and will take place at the Innovative Media Research Commercialization Center, located in Stewart Commons at the University of Maine at 7:00p.m. I am at Caltech on March 9th, 2018! The exquisite marriage of movement, animation and sound creates animation that is both cinematic and theatrical. Miwa Matreyek’s multisensory, multimedia experiences take the audience on a fanciful journey through projected animation and real time shadow play. Admission is free. RSVP online beginning Tuesday, April 4, at 9 a.m.
Rhythms + Visions / Expanded + Live 3 will light up the outdoor spaces of USC School of Cinematic Arts Complex in an evening of music, interactive animation, projection mapping, animated inflatables, and virtual reality. Innovative artists Refik Anadol, Miwa Matreyek, and Patterson + Reckinger will perform an eclectic program of contemporary visual music and audio-visual art. Groundbreaking artist Refik Anadol, who has performed visuals with the L.A. Philharmonic at Disney Hall, will make visual music on a super-panoramic 70-foot screen. On a second stage, Miwa Matreyek’s full-body shadow will interact with magical animated worlds. Patterson + Reckinger will perform an animated work for three toy pianos and three-channel, one-bit electronics, and the VR Visual Music Lounge will offer exciting virtual-reality musical experiences from international artists as well as USC faculty and students. Presented by USC Visions and Voices: The Arts and Humanities Initiative. Organized by Michael Patterson, Candace Reckinger, Eric Hanson, and Scott Fisher (Cinematic Arts). Get rapt in a cinematic vista of animation, theater, and shadow play on this thematic journey that takes you through Earth’s history—from its first spark of beginning to the complex world of accelerated human interaction, the Anthropocene. Like a 21st-century diorama for the 22nd century, Miwa Matreyek—who has performed worldwide, including the Tate, MoMA, Lincoln Center, and the Exploratorium—uses computer-generated animation mixed with live performance in silhouette to create her own form of storytelling that has intrigued audiences of every age. This marquee series of the Visitors Program is designed to showcase notable national and international artists, designers, and scholars whose work or point of view is engaging and topical. 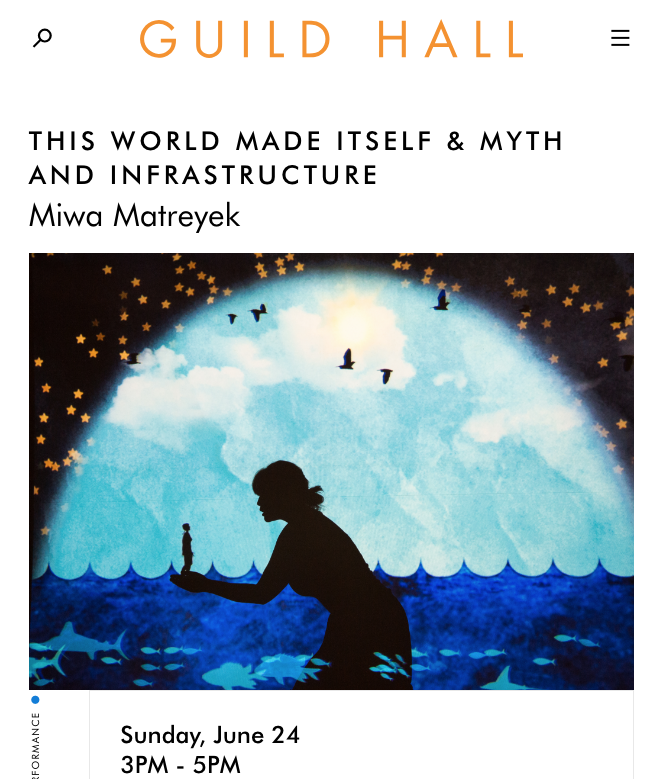 Please join us for a lecture by Miwa Matreyek animator, director, designer, and performer. Town Hall Seattle with Anna and Elizabeth, February 10, 7:30PM! Opening to the beautiful harmonies of Anna and Elizabeth! River Song Quintet was kind enough to ask me to join them at the REDCAT with one of my pieces, This World Made Itself. River Song Quintet, poet David Baker and I all met at Tutti festival at Denison University in Granville, OH in 2015. I am happy and honored to reunite with them in LA! I am excited to tell you that I have shows coming up in New York at Lincoln Center this fall, October 20-23. For the first time, Lincoln Center is collaborating between the White Light Festival and the LC Kids Family Programming to present me in multiple contexts, including primary school field trip programs. All shows are at the Clark Studio Theater on the 7th floor of the Rose building, 165 West 65th Street. I would love to see you there, and please spread the word! So this April is going to be pretty wild for me. 7 shows in one month, lots of travel! at CAC in New Orleans!!! Cloud Eye Control and I will be in Providence to perform Half Life in November for First Works! There will also be a good amount of school engagement stuff through RISD and Brown, so look out for that as well. See you there! There will be two showings, with each work presented back to back. Each showing is approximately 50 minutes.